"We export twice as much to England as we do to any other part of the world." On the day that a deal was struck between David Cameron and Alex Salmond over the referendum on Scottish Independence, arguments are already being deployed by both sides of the debate over whether the Scots would be better or worse off outside the UK. Echoing claims made by fellow Liberal Democrats back in July when the pro-union campaign launched, Scottish Secretary Michael Moore this morning reiterated that Scotland exports twice as much to England as it does to the rest of the world combined. It's not difficult to see where this claim originates from. Each year, the Scottish Government commissions the 'Scottish Global Connections Survey' (GCS) which is sent out to a sample of Scottish businesses and asks for information on their sales exports and relationships with businesses overseas. Businesses which were known or potential exporters had a greater chance of being sampled. The findings of the latest survey for 2010, published in January this year, show that Scottish exports (excluding oil and gas) to countries outside the UK had a combined value of £22 billion while exports (excluding oil and gas) to England, Wales and Northern Ireland totalled £44.9 billion. While this broadly supports Mr Moore's claim, it is important to bear in mind that this study refers to all three of the other countries of the UK, not just England as the Scottish Secretary said. It's also worth pointing out that the absence of oil and gas leaves a fairly large hole in these export figures, and their inclusion could significantly alter the picture painted by this study. However the Scottish Government themselves are more wary of these figures than is obvious at first glance. In 2005 they detailed all of the caveats to using the survey data as a measure for Scottish trade, and concluded that while it is the "best currently available" source for such figures, there are significant theoretical and technical difficulties associated with them. The main such difficulty is that, as a region of the UK, Scotland enforces no legal requirement for companies to report their financial information at a UK-regional level - i.e. companies are not obliged to measure their financial data for Scotland, England, Wales and Northern Ireland separately. This is why a survey such as the GCS is used, which means that many of the figures being relied on are estimates made by the relevant companies rather than hard financial data. "Forty one companies mentioned how difficult it was to split Scottish sales from UK sales, typically citing accounting practices which meant companies produce consolidated UK annual accounts." A much less obvious issue is that not all businesses recognise the concept of an 'export', depending on the sector in which they operate. According to the guidance notes on the GCS questionnaire, an export is a sale to a company which is not normally resident in Scotland. However certain types of company may misunderstand or even completely miss this. The Scottish Government gives the example of letting a hotel room to a non-domiciled customer, which would be regarded as an export in these statistics but may well not be recorded or interpreted as 'exports' by the individuals filling out the questionnaire. Hence, there could be a lot of under-reporting in certain sectors. 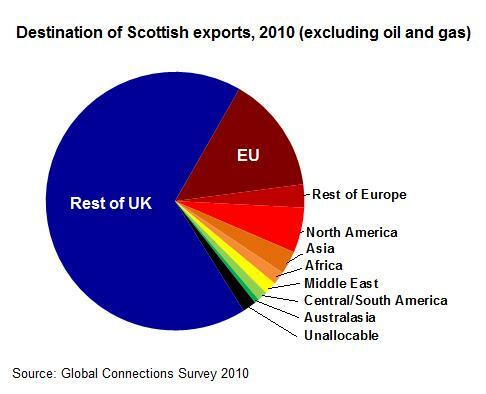 So while the GCS might be the best source for data on Scottish exports, we shouldn't assume that the figures are a perfect representation of the situation. What about oil and gas? The exclusion of oil and gas exports from the statistics seems like the elephant in the room, but the Scottish Government explains the reason for them being ignored. Data on oil and gas is not collected in order to match principles used by UK National Accounts, which classifies the entire oil and gas supply as exports from the UK rather than breaking them down regionally. In other words, the only data available for oil and gas exports is for the UK as a whole, so we can't draw any conclusions yet about how much of this is accreditable to Scottish business. The claims accurately report statistics from the Scottish Government, save for imprecision from Michael Moore on incorrectly specifying England rather than the rest of the UK as a whole. Sadly, given drawbacks these figures aren't on the firmest possible ground. It's especially worth bearing in mind that oil and gas are omitted from the survey. We can't know the extent to which this would change the balance of exports, but we could expect it to be significant. How popular is the UK for Chinese investment? Does Belgium trade more with India than the UK does? If the drug trade were a country, would it be part of the G20?